BASAL kit is a Starter Kit launched by ELaf brand. When I first saw it, I couldn't believe it was so thin! 36.6mm*15.0mm*128.5mm, yes, this is the size of the BASAL Kit. What you can't believe is that there is a 1500mAh built-in battery hidden in such a thin body. This product is paired with our familiar Vape Tank, GS BASAL Tank. 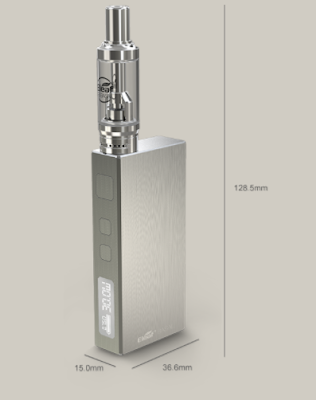 GS BASAL has a slender design and can store 1.8ml e-liquid. With GS Air 0.75ohm Head and GS Air 1.5ohm, BASAL kit will give us a better taste. Of course, it also supports you to replace the Atomizer with 510 thread, 30W maximum output will be very good to meet our taste needs. BASAL's frosted treatment gives us a better gripping experience. The design of the three buttons makes BASAL look more tidy. It uses Quick Charging, Dual Circuit Protection, to give us an efficient and safe experience. What are you hesitating about such a good product?